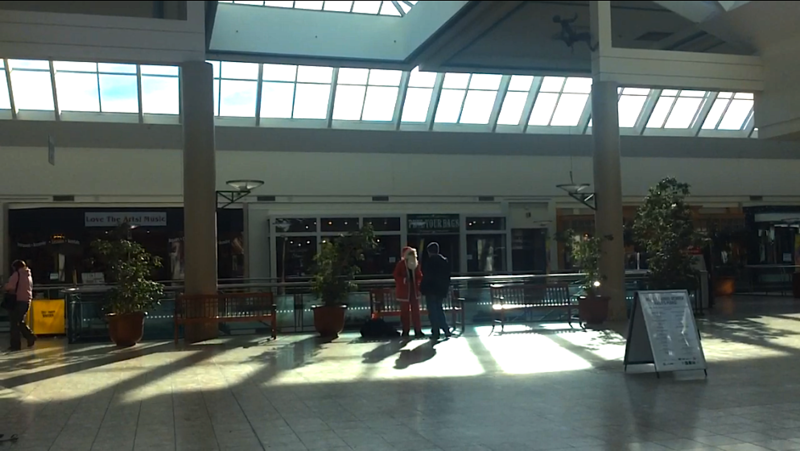 In March, 2016 I dressed as Santa Claus and spent a day at the mall in my hometown. The Steamtown Mall, like many malls in contemporary America, is mostly empty except for a few knitwear, candy, electronics, or dollar stores, and a barber shop or pizza restaurant in the food court. I got dressed in the bathroom and sang John Denver's "Take Me Home, Country Roads" in front of what used to be a sofa store on the second floor. I met a young man from St. Louis. He said he was visiting from his school and tried to sell me magazines, then we played Dance Dance Revolution in the arcade. Special thanks to my friend, John Ingiamo, for helping me document this day.